How you can realign streams to look and perform as a natural waterway, with improved stream ecological values. 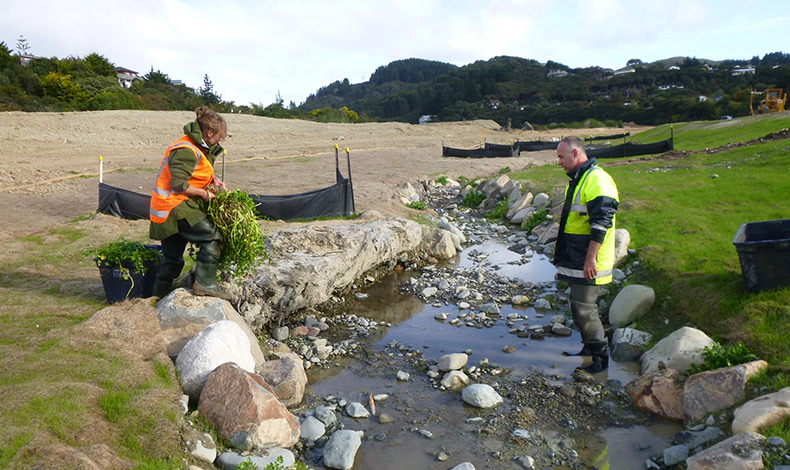 Duck Creek in Whitby, Wellington, has been shifted 50 metres sideways over a length of one kilometre to make way for a Todd Property Group subdivision. The consent conditions required that the realigned stream look and perform as a natural waterway, with improved ‘Stream Ecological Values’ (SEV). Having first established the baseline parameters of the existing stream habitat and rescued fish for transolocation, Boffa Miskell worked very closely with the surveyors and engineers to map and plan the correct range of water gradients, habitats, banks and substrate along the new channel and flood plain. Much of the detailed design was done with the contractors on site during implementation. A successful innovation was salvaging the cobbles from the existing stream, complete with their associated invertebrate life, algae and lichens. Their placement in the newly formed channel substantially fast-tracked the colonisation of the realigned stream. Now, one year on, natural processes have created a stream habitat unrecognisable from a natural one, with fully recolonised aquatic biota and a diversity of fish species that mimics that of the former stream environment.